“We have to visit the swimming pool six times a week. Konstantinos has frequent medical examinations and has to follow a special diet in order to avoid immobilization caused by fattening,” said Despoina Komnimaki, mother of Konstantinos, a six year old boy. Konstantinos was born with a common heart problem. His mother explains that she already knew during her pregnancy that Konstantinos would later face heart problems. But, she and her husband were assured that the disease could be treatable through surgeries. 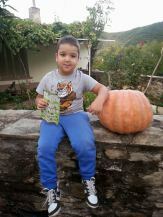 At a very young age Konstantinos went into surgery and got his heart fixed. The doctors assured his parents that he is going to recover completely, however today he is suffering from an orthopedic disease which cannot be treated with medication and which forces him to use crutches in order to be able to walk. Konstantinos is suffering from the Legg Calve Perthes disease, which is a hip disorder that affects children between the age of 4 and 10. The main cause is that there is a disruption of blood flow and bones can die off or stop growing due to lack of blood. “Unfortunately it is an insidious illness, which is perceived only when it has done great damage that is usually irreversible,” said Despoina. After Konstantinos’ parents were informed about the disease they were struggling to find a way to explain to him his illness and encourage him in the same time, as he was facing difficulties to sit in a wheelchair and use crutches. For that purpose, his mother decided to write a fairytale dedicated to his problems. “I thought I could present a little heart with crutches and introduce it to adventures similar to those Konstantinos was facing. I started the fairytale and I saw that he liked it. The fairytale’s heart shared the same thought as him: ‘Are my friends going to make fun of me? Am I going to be alright?,’” said Despoina. She also explains that her fairytale provided her with a platform to talk about the racism that people with mobility problems, including her son, face. “We experienced a strong shock when we started to descend in the neighborhood with the crutches. People stared at him curiously, and we heard characterizations as ‘lame’. So the fairytale’s hero plays at the park, and faces similar problems but it uses the full acceptance of its friends and the power of love as a shield!” said Despoina. She recalls that Konstantinos’ reaction to the book was positive. He was very happy when he first saw the fairytale. The family’s daily life has changed a lot after Konstantinos’ syndrome, as he needs help to go to the bathroom or even to get dressed. As Despoina describes it, Konstantinos is a lively child who wants to run in the school yard with the other children. This is the reason why she has to be present during the school’s breaks in order to make sure that he doesn’t neglect to use his crutches. “Unfortunately, Konstantinos couldn’t take part in team games because of his disease, and I couldn’t ask his friends every time to sit down and play with him,” said Despoina. She and her husband decided to become children again and play with him. Konstantinos is now playing the piano and despite his orthopedical disease he takes part in swimming races. Thinking of the future, Despoina wants to be optimistic. When I ask Despoina for the future or if she would like to have another child, she responds negatively. “A new pregnancy is impossible right now. But I don’t worry because I already feel like I have a full life. Besides that, we are in the middle of the crisis and the everyday expenses for Konstantinos are numerous. And the Greek government hasn’t help us with anything. But I want to be optimistic abour his and our future,” said Despoina. Take a minute to hit the Like or Share button if you liked this post. Or follow viewpoint to stay updated. Feel free to comment and share your thoughts.